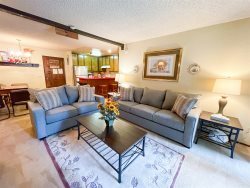 Pet Friendly, 1 bedroom & Loft & 2 bath condo located in the heart of Mammoth Lakes on the green line shuttle stop to the Eagle Lodge Ski Area. Sleeps up to 6 and approx. 1100 sq. feet. You enter the unit from one flight of outside stairs and then the first floor is the living room, kitchen, dining room, bedroom and 1 bath...the 2nd floor is the loft and 2nd bath. The downstairs bedroom has one Queen bed. The Living Room has 1 Queen Sofa Bed. The loft has 1 set of Bunk Beds with a Twin on the top, a Queen on the bottom and a trundle pull out under the bunk. Wood-burning stove in the living room. 3 TV's, LR, DR and Loft. Keurig coffee maker. There are 2 outside parking spaces available.Jacuzzi and Sauna on-site. Swimming pool available in the summer months only. Coin-operated laundry facilities located in the common area near the office. Phone in unit 760-924-2897. Wifi Internet Access in unit. No Phone in unit. COMPLIMENTARY INTERNET and CABLE TV are provided, however NO REFUNDS will be given for connectivity problems or Internet failure. TOT LICENSE 3392-WF02. This condo was a perfect location for our weekend. We walked everywhere. The pool was perfect for our family too! First time at Mammoth and my family had a blast both on the slopes and in our loft. The place was clean and was a great place to relax after riding all day. We will definitely be looking to stay there again soon. Really loved the rental property. This place is great. They were very responsive when we tried to extend our stay. The condo was cute and clean. We really like the big family table for games and the spa for after boarding. Will definitely rebook. Thank you so much for everything! We loved the place, once we were able to dig to it! Lol. It snowed so much!!! But it was exactly what we came for! Wife and three friends of ours stayed here this past weekend. Positives - cozy, well-maintained unit, great location, upper floor unit, well-stocked kitchen, comfortable beds, clean showers, great fireplace w/ plenty of wood, dog-friendly. Easy check-in process. Picked up key and was in the unit in just a few minutes. Overall, for the price, location, and amenities, I found this rental to be a good value. Will certainly stay here again if available.